Yesterday I appeared before the House Judiciary Committee to talk about a balanced budget amendment to the U.S. Constitution. The other witnesses were Former Governor and Attorney General Richard Thornburgh, Former CBO Director and current president of the American Action Forum, Douglas Holtz-Eakin, and Professor Philip Joyce of the University of Maryland. I began by pointing out the enormity of the problem: CBO projects that absent policy change, the nation’s debt will be 90 percent of GDP in just seven years. This is an important figure because research suggests that when national debt levels get much above this point, their growth rates tend to slow. In the median case, they slow by 1 percentage point and in the mean case, their growth rates are cut in half. The video is here (my testimony begins at 54:30). Here is my written statement. 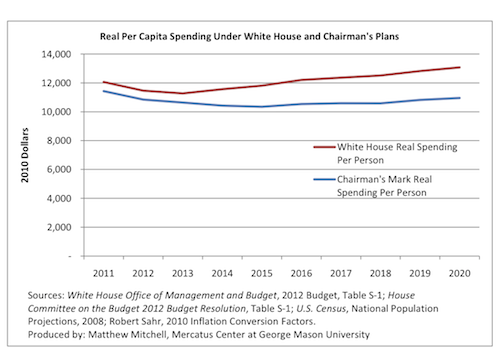 This entry was posted in Balanced Budget, Institutions and tagged American Action Forum, CBO, Douglas Holtz Eakin, GDP, government services, Great Recession, growth, House Judiciary Committee, make, Maryland, percent, reform, research, vote on October 5, 2011 by Matt Mitchell. Purchasing Preference Laws: Who Wins and Who Loses? Like many states, New Mexico has what is known as a “government purchasing preference law.” This is a statute that requires the state to give preference to local businesses when it purchases products and services on the market. The current law has not achieved its intended purpose. Out-of-state companies are able to easily qualify as “resident businesses” and reap the rewards of this status. Basically local companies are hit by a double whammy — they aren’t able to truly benefit from the New Mexico preference law yet they’re penalized in other states because New Mexico has a preference law. In an attempt to “level the playing field” the state’s business and organized labor communities have met with State Senator Tim Keller to draft an updated government purchasing preference law that is modeled after other states’ laws. Really? All New Mexicans? Of course, New Mexico businesses benefit from a leg-up against the competition. (At least in the short run; one could argue that over the long-run businesses that are sheltered from the rigors of competition eventually stagnate). But what about the customers? Do New Mexico taxpayers really benefit when they have to pay extra for government services? The data suggest otherwise. In an article in the journal Public Choice, economists Steven Craig and Joel Sailors studied the impact of purchasing preference laws on state expenditures. They found that states with such laws spend about 3 percent more per capita. Moreover, they found that the tax base does not rise enough to pay for the extra spending and that revenue must be raised as well. As far as economic theory is concerned, purchasing preference laws make little sense. The aggregate costs to taxpayers/consumers outweigh the aggregate benefits to local businesses. And when other states have similar laws, local monopolies dominate everywhere. In addition, there tend to be higher production costs when firms are sheltered from competition as well as rent-seeking costs when firms sink resources into lobbying for such protection. This was bad economics during the mercantilist era and it is bad economics today. A real step toward reform would be a strong interstate agreement against all purchasing preference laws. This entry was posted in Tax and Budget and tagged Dale Dekker, government services, labor, make, New Mexicans, New Mexico, percent, Public Choice, reform, spending, State Senator Tim Keller, tax on December 29, 2010 by Matt Mitchell. Since the Labor Department began keeping records in the 1950s, the only other time that the cuts were so steep was in the harsh 1981-2 recession. Anthony Picente decided he’d had enough. The state of New York had fallen $34 million behind on payments to Oneida County, the Upstate county around Utica where Picente is the top elected official. Picente was counting on the money to reimburse the county for services it provides that are in high demand these days: job training, food stamps and other key pieces of the social safety net. By July, Picente hadn’t seen a check from Albany in months. … To deal with its own cash crunch, Oneida County started doing to its contractors what the state was doing to the county: skipping payments. At one point, the county owed a local agency for youth roughly $800,000. Austerity is painful. When people come to count on services and jobs, they suffer when the rug is pulled out from under them. Since these governments depend almost entirely on the private sector for their resources (they only have what they can tax or borrow from the private sector, plus a little more that they charge in fees), this is simply not sustainable. In fact, I view the state and local government sector as not unlike the finance or housing sectors of a few years back: unsustainably large and systemically risky. And as the current fiscal crunch shows, it isn’t just the taxpayer that is getting hurt: state and local workers, private contractors and those who have come to depend on government services are all feeling the squeeze. In my view, the real shame is that unrealistic and unsustainable promises were made to these people. Public sector unions and advocates for the poor should be the first to object to unsustainable growth in state and local spending. In a few days I plan to post on the reasons why state and local governments have experienced such excessive growth. This entry was posted in Tax and Budget and tagged Anthony Picente, county, government services, growth, Labor Department, local governments, New York, Oneida County, spending, tax, unions on October 22, 2010 by Matt Mitchell.